A settlement that could pay up to $657.5 million to more than 10,000 ground zero rescue and recovery workers sickened by dust from the destroyed World Trade Center goes before a judge Friday, and he has said he favored a settlement but planned to analyze it carefully to make sure it was fair. Mayor Michael Bloomberg called the proposal "fair and reasonable," a sentiment echoed by one of the negotiators of the deal that was announced Thursday night after years of fighting in court, The Associated Press reports. According to Bloomberg, WTC Captive Insurance Co., a victims’ fund set up after the Sept. 11, 2001, terrorist attacks, reached a settlement of as much as $657 million with 10,000 workers claiming respiratory illness stemming from rescue and recovery efforts at the World Trade Center site. The settlement provides a system for paying compensation to city employees and contractors, including construction workers, firefighters and police officers, according to a statement by WTC Captive distributed by PR Newswire. Individual settlements will range from thousands of dollars to payments in excess of $1 million, according to the statement. The pact - which must be approved by a judge and 95% of the plaintiffs - creates a point system for payouts based on the severity of each person's illness. The settlement calls for a neutral third party to review claims. Compensation will be based on a point system dividing people into four tiers depending on severity of their illness or injury as determined by doctors. Each point is worth roughly $10. 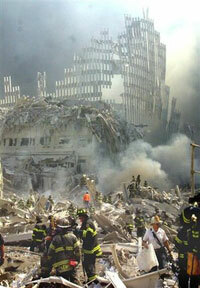 Victims must prove they were at Ground Zero and that their illness was caused by their work there. They will get more points the longer they were there - and pre-9/11 conditions, smoking and age will be taken into account, insiders said, New York Daily News reports.